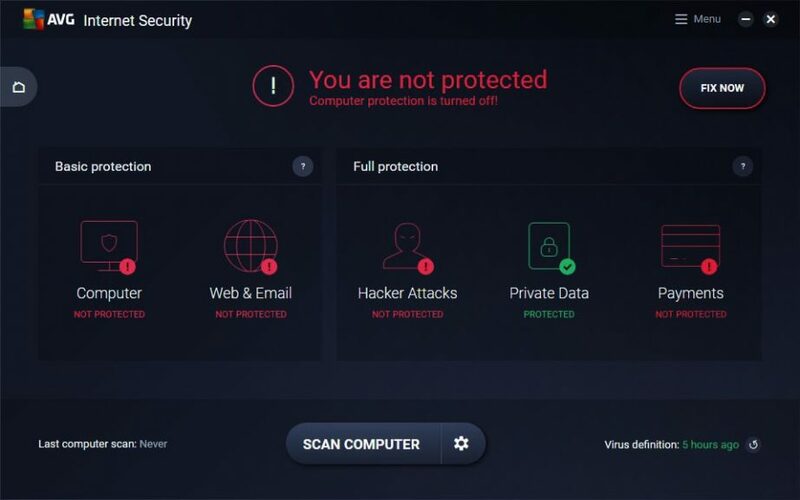 AVG antivirus is a convenient and useful tool that protects your computer from numerous cyber threats – hacker attacks, viruses, and malware. However, for various reasons, one day you may want to switch it off temporarily or permanently. For example, the antivirus app may block a harmless program that you need to download or conflicts with the software installed on your PC. Whatever the reason for AVG removal or disabling is, you need to do it correctly. In this guide, we’ll tell how to minimize the risks when disabling AVG and how to turn off the app completely on Mac and Windows computers. If you want to disable AVG antivirus temporarily, there’s no need to delete the app itself. Just follow the simple steps to switch the protection off for a while. Open the start screen of the app by double-clicking the shortcut on the desktop or the icon in the system tray. Expand the “Options” menu from the right upper corner of the screen. Click the “Advanced settings” options and choose the “Temporarily Disable AVG Protection” command in this submenu. Confirm your intention to disable the protection by clicking the “Temporarily Disable AVG Protection” button that appears rightward. At this stage, you can choose the duration of disabling – 5, 10 or 15 minutes. Alternatively, you may choose to disable the program until the next restart. You may as also disable the firewall if you need by clicking the button lower in the same window. Make the final confirmation with the help of the OK button. Now, your AVG protection is disabled. Collapse the app and continue working. Keep in mind that you are not protected from malware while the app is disabled and try to switch on the antivirus as soon as possible. 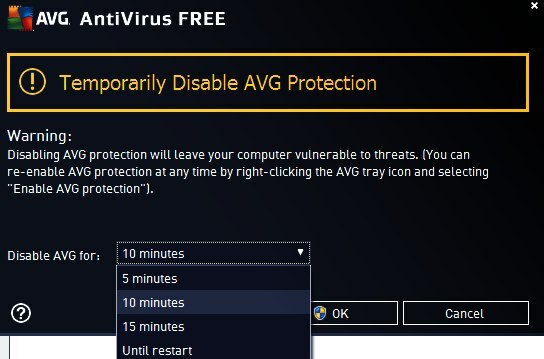 If for some reason you are going to disable AVG protection permanently (for example, you want to try another antivirus product), you can also do this without removing the app. Look for the AVG icon in the system tray and right-click on it to bring up the context menu. You will see a small AVG window, displaying the status of protection. 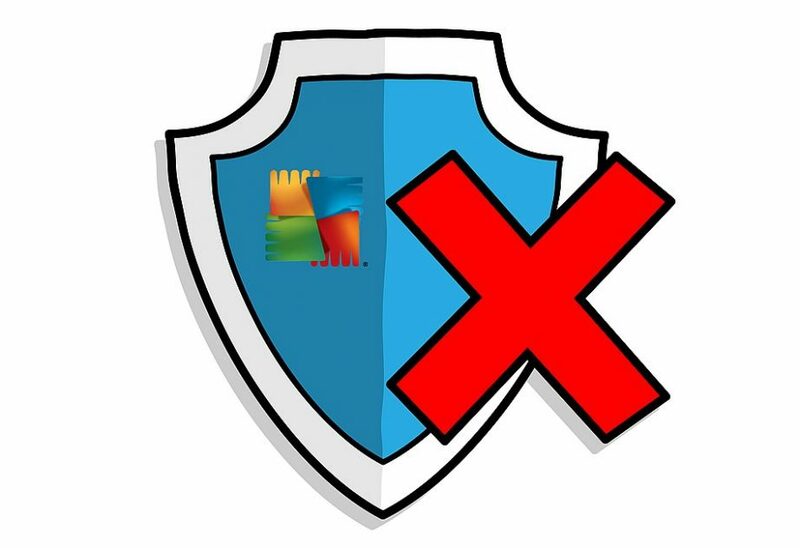 To disable AVG, alter the position of the slider from the “Protection is on” to the “Protection is off.” Next, confirm the disabling in the pop-up dialog window by clicking the “Yes” button. Mind that you need to have Administrator access rights to do it. Don’t forget that by disabling AVG you don’t remove it from the PC. The app is still installed on the hard drive; moreover, it can conflict with other programs. 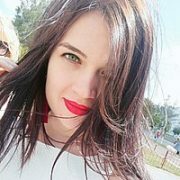 If you are not going to use the product in the future, learn how to remove AVG completely. All in all, AVG offers eight separate security shields, which provide comprehensive protection when used together. If you need to perform a certain task that requires switching off one layer of protection, you can disable only one shield without compromising your security. At any moment, you can switch on the disabled shields manually by changing the switch position to the “on” status. There’s no need to remove the AVG app if you need to turn off your antivirus protection for a while. Just disable it temporarily, following the instruction: AVG won’t uninstall, but it will stop scanning your PC for some time. Don’t forget to switch on the protection after you’ve done everything you wanted. Keep in mind that turning off antivirus protection makes you vulnerable to malware.